Clothing lines are of high abundance in the MMA world, maybe more so than any other sport. The trend of creating catchy t-shirts to represent the sport of MMA has been popular since the creation of brands like TapOut, Affliction, and Xtreme Couture; you will even find MMA Elite products in your local Wal-Mart. From “walkout” clothing to lifestyle clothing, clothing lines, both active and defunct in MMA are undoubtedly measured in number in the thousands. These clothing line businesses are very beneficial to the MMA world and whether they are premier brands selling products nationwide (even worldwide) or smaller brands that tend to remain in the area they are being produced, the companies often give back tremendously to the sport of MMA. More often than not, these companies “sponsor” fighters meaning that in exchange for wearing the brand, a fighter is compensated with monetary funds or some sort of goods that act as an exchange for helping a brand grow through promotion. Company X will sponsor Fighter Y in hopes that Fighter Y’s fan-base and outreach will lead to sales and exposure for Company X. 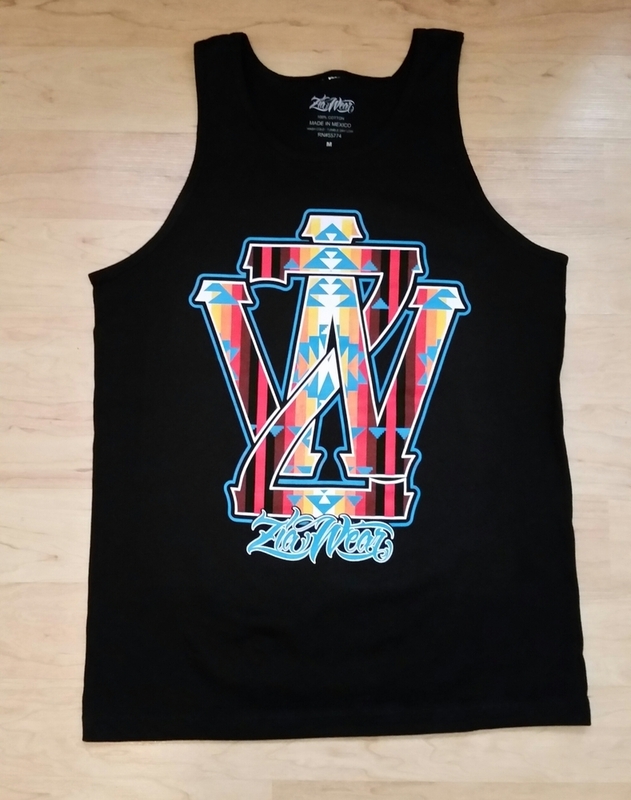 The newest logo design hitting the streets for Zia Wear has a Native American inspiration to logo design and really brings originality and creativity to the table for the already innovative clothing line. The ability of a company to offer these services to the fighters is often dependent on how well the merchandise is selling and the overall health of the company. When the recession hit the country several years ago, many companies were no longer able to offer services in fear that they would be spread too thin financially. As our economy is progressively improving, more companies are starting to reach out in the way they used too. When a fan buys a shirt, or any merchandise from a company they are actually directly supporting the health of the MMA scene by helping drive money through the sport. A fan buys a shirt, the shirt company supports a fighter, a fighter is aided in their endeavors, the success of a fighter helps grow the promotion they fight for and the promotion delivers the entertainment the fans seek; it is the MMA’s world’s “Circle of Life”. New Mexico has such a company, one that gives back to the fighters and does a great job representing the spirit of the region. “Zia Wear” was launched in early 2010 by Ivan Winchell and in doing so, created one of the more iconic logos and successful lines of clothing in New Mexico MMA’s scene. Zia Wear has a very visually appealing logo that is both simple and iconic. The “ZW” (Zia Fight Wear) logo is made up of the two initials Z and W overlapping one another in bold lettering centered in most of the brand’s shirts and “Zia Wear” on the bottom of the logo in calligraphic, cursive, and stylish font. While most MMA shirts are full of designs, tribal marks, and/or large montages of images, Zia Wear delivers a substantially appealing product in a very subtle manner. Another catchy design from the brand is a logo with the initials of New Mexico (N & M) written left-to-right that are overlapped on the tai-end of the N and start of the M. Another simple logo that is very appealing; some products feature the logo as a stand-alone image bold and large on the front of the clothing and on other products, the logo acts as a compliment to the clothing design. One of the more often worn shirts features a flag design, the outline image of the American Flag but instead of the stars in the left, upper-corner the NM logo acts as its replacement to make the shirt very New Mexico. The brand is definitely worth a look from anyone who wears t-shirts, not just the MMA fans who are proud to wear New Mexico emphasized logos. The “Zia” symbol is the ancient Sun symbol of the Zia Indian Pueblo. The flag was adopted in 1925, 13 years after New Mexico’s statehood and was derived from a design created by Anthropologist, Dr. Harry P. Mera who attributed his design to a sun-symbol design seen on a lay pot made by an unknown woman from the Zia Pueblo. Zia Wear encompasses both the New Mexico and Indian roots of the “Zia Symbol” in the clothing. New shirts released recently encompass the “Native” design; featuring five-colors and design print that represents a “Native American” look are new to the Zia Wear line and of course the brand has plenty of red and yellow, which are our State’s colors. The red and yellow represent the old Spanish (Spain) royal colors. The clothing brand definitely sticks to the roots of which it represents as our state has proud ties to the Native American and Spanish cultures. One of the more iconic designs for the Zia Wear clothing line, the Spanish royal colors of Red and Yellow highlight the “NM” logo depicted within the outlines of the flag. The brand isn’t confined to the world of combat sports, in fact former University of New Mexico collegiate basketball player Alex Kirk has even been spotted wearing the brand and hopefully the NBA hopeful will continue to represent the area through the promotion of the brand. The clothing can be worn by just about anyone, from New Mexico natives to those who are of Hispanic and Native American; from fans of the fight game to people who just genuinely find the clothing to be appealing. There are several fighters who represent the Zia Wear brand within our region’s combat sport’s scene; Ray Borg and Tim Means, both of which fight out of Albuquerque’s FIT NHB gym are huge supporters of the Zia Wear brand and both Borg and Means are two of the most successful locals currently competing in MMA at the sport’s highest level. Borg of Tucumcari, and Means of Moriarity both compete for the Ultimate Fighting Championship (UFC) promotion. Newly signed UFC Flyweight Ray “The Taz-Mexican Devil” Borg and “The Dirty Bird” Tim Means shared their thoughts on Zia Wear in which they both told a story of how great Ivan and the Zia Wear brand treats them and how their focus on the representation of New Mexico really sets them apart as a brand. The brand also has ties to the boxing scene in New Mexico as Zia Wear is proudly worn by the #8 ranked American Light-Welterweight Boxer Fidel Maldonado Jr. and Blue Chip Prospect Brian Mendoza. Both of the talented boxers took the time to share their own thoughts on the Zia Wear brand. The staff here at Southwest Fight News would like to send our appreciation to Ivan and the Zia Wear brand for their efforts in supporting our local combat sports scene. It was announced on Facebook today that Zia Wear would be designing the walk-out shirt for Damacio Page and his upcoming Legacy FC title fight, stay tuned for the release of what should be another great piece of merchandise. Personally, I have ordered products from Zia Wear and can state that not only is the merchandise professionally made but they are very comfortable fitting and very visually appealing. Not only does the brand represent our area and the combat sports scene, but the hard work that goes into making the clothing line operate which allows for prompt shipping and fresh, new products should be celebrated. Help us in sending our best wishes to Ivan and Zia Wear in their endeavors. How Could The UFC Sellout A Venue If They Come Back For Round Two? Why Is New Mexico Still A Long Shot To Play Host To A Potential UFC Event?